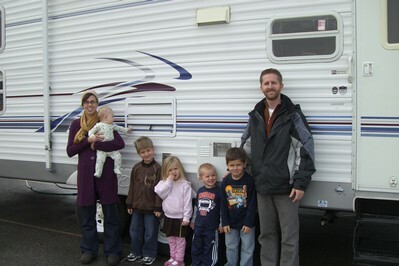 We left Eureka and headed to San Jose, CA where we picked up our new "home on wheels". We continued south for Nick to finish a job in Oxnard, CA. We stayed at two campgrounds in Santa Paula, CA. We fell in love with Steckel Park, might have been the fact that we were one of 3 or so campers there during our whole 3 week stay. We ended the month by going even further south and exploring Santa Monica and Malibu. And then began our week long trip back up the coast of California. ~For the next 12 months we will be participating in "The 12 Project", basically "Take a photo of your family once a month. Write a few things about that month. Make it into a book at the end of the year." Learn more about "The 12 Project" here and here. I am so happy i found your blog! I am a mama to 6 little ones and my husband and i are making plans to travel full time in the next few years. I had no idea how we were going to do it with so many little people but I have hope! thank you so much for sharing your journey! I will be following along and hoping to learn from you before we take the leap. btw...i am ALWAYs trying to convince my hubby I need dreads...im not quite there but maybe close? ?